A YEAR AGO this week, Lani Guinier's appointment to be the nation's top civil rights enforcer went down in flames. On June 3, 1993, President Clinton withdrew her name from consideration as chief of the Justice Department's civil rights division. She espouses ideas, he said, "that I, myself, cannot embrace." Clinton admitted he hadn't read Guinier's law review articles before submitting her name to the Senate; if he had, said the president, he would not have nominated her. This was surely the first time in history that a nomination was yanked with the excuse that the president hadn't realized just how wacky the nominee's published opinions were. For 12 months now, Guinier and her allies have maintained that she was done dirt. She was stifled, they claim. She was the victim of a conspiracy to distort her views, deny her a fair hearing, and ban her ideas from open debate. The day after her nomination was withdrawn, Guinier raised the grim specter of "a new intellectual orthodoxy in which thoughtful people can no longer debate provocative ideas" without disqualifying themselves as public servants. Since then Guinier has denounced the "hysterical assault in the press" that sank her nomination. She told the National Association of Black Journalists, as Stuart Taylor reported in Legal Times, "that she had had 'censorship imposed against me' by biased, white-run news media." In January, at MIT, she claimed she "could not explain misconceptions contained in ideas attributed to me because I was not allowed to speak for myself or even to be myself." "The censorship imposed against me," Guinier writes, "points to a denial of serious public debate or discussion about racial fairness and justice in a true democracy." By publishing the book, she continues, "I hope to spark the debate that was denied in the context of my nomination." Get a grip, Lani. You haven't been censored. You haven't been silenced. In fact, you haven't stopped talking. As Guinier's nomination was pending in Congress, Ted Koppel gave her an entire "Nightline" program to explain her views. Mere mortals appearing on "Nightline" usually have to confront their critics. Guinier had ABC's air to herself - "the opportunity," she put it, "to come on this show to talk to you about who I am and why it is that I should be the assistant attorney general for civil rights." Later came the press conference. The flattering cover stories in The New York Times and Washington Post Sunday magazines. The swarm of radio and TV interviews. The fawning pieces in Ms., The Village Voice, and the Columbia Journalism Review. The high-octane lecture bookings, including the MIT speech (which was reprinted in The Boston Globe) and speeches at the Kennedy School of Government and the American Society of Newspaper Editors. Last week she was the commencement speaker at Northeastern University Law School. In a few days she delivers Harvard's Class Day address. But wait. There is one person who has succeeded in stifling Guinier's opinions, twisting the meaning of her original articles, and keeping her idiosyncratic views of democracy from being debated in open forums. This fiend is -- Guinier herself. Guinier's new book is being touted as the complete, un-sound-bitten version of those explosive law review pieces that generated such controversy. "With the publication of this book," the preface notes, "the reader has her words in full context and with her own full explanations." Ah, but the reader doesn't. 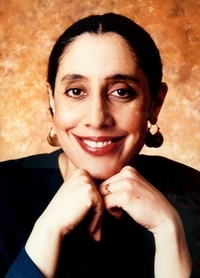 Guinier was dubbed "Quota Queen" for insisting that level playing fields aren't enough. The courts and the government should use the Voting Rights Act, she argued, to guarantee minorities not just equal access but equal results. For example, she wrote in a 1989 article that civil rights enforcement must go beyond "the basic process of decision making to a result-oriented inquiry, in which roughly equal outcomes, not merely an apparently fair process, are the goal." In the book, that passage has disappeared. In a notorious comment in the Virginia Law Review, Guinier had questioned: "Would descriptively black representatives who were also Republicans qualify as black representatives?" That passage has disappeared, too. She had called for dumping "simple majority rule" and "one legislator/one vote." For giving black legislators "a minority veto on critical minority issues" and "requiring a supermajority vote on issues of importance" to whites. She had drawn a bitter portrait of American democracy: "a system dominated by irrational prejudice" and governed by "the illegitimacy of majority rule where the majority is permanent and constituted on the basis of prejudice." Guinier, it turns out, doesn't have the courage of her convictions after all. She won't defend her out-of-the-mainstream opinions; she won't renounce them; she won't debate them with her critics. She just sidesteps them, hiding behind an inky cloud of accusations and complaints about others. The truth is that nobody censored Guinier. Her nomination didn't melt down because she was misunderstood: She was understood only too well. She was considered, and rejected, on the basis of her ideas -- ideas that now even she backs away from.